This ASCD Study Guide is designed to enhance your understanding and application of the information contained in Tasks Before Apps: Designing Rigorous Learning in a Tech-Rich Classroom, an ASCD book written by Monica Burns and published in October 2017. You can use the study guide after you have read the book or as you finish each chapter. The study questions provided are not meant to cover all aspects of the book but to address specific ideas that might warrant further reflection and prompt you to make connections with your own classroom practice. Although you can think about many of this guide's questions on your own, we recommend forming a study group with grade-level colleagues who have read (or are reading) Tasks Before Apps, or using this guide as you read and reflect on the book in a professional learning community (PLC). How does the ACES framework (Access, Curate, Engage, and Share) connect to your current practice? Think about an upcoming unit on your calendar. What are your learning goals and expectations for students? Figure 1.2 demonstrates how tech-rich activities can be embedded into existing units. What is one tech-rich activity you can add to an upcoming unit? How will this activity energize and elevate your learning goal? When checking for understanding in your classroom, how can rubrics, exemplars, checklists, and graphic organizers support students as creators? In this chapter, the author describes content consumption and content creation. How are your students currently consuming content with digital devices? Figure 2.1 describes different types of digital products. Which type of product have you created with students before? Which type of product connects to your learning goals for an upcoming unit of study? On page 29, the author lists several guiding questions to help teachers choose digital tools for their classrooms. Review the questions as you decide which type of digital tool will best support the needs of your students for an upcoming learning experience. Supporting the creation process is a reminder that the journey is just as important as the destination. How will you support students as they create a digital product? In what ways can you differentiate for the needs of students in your class? On page 47, the author lists examples of questions you can use to gauge student interests. What questions might you pose before an upcoming unit to learn about your students' interests? What types of choices do your students have throughout the school day? How do these choices connect to content consumption and content creation? Figure 3.3 demonstrates how different student interests can connect to the same learning goal. Think about an upcoming unit of study. What is a learning goal you will address? How can it be tailored to different interests in your classroom? On page 55, the author states, "Establishing an audience early on when students are working on a task is crucial." How can an audience set a purpose for student creators? In this chapter, the author describes three different types of collaboration. How have your students engaged in different types of collaboration? On pages 62–64, the author describes different types of technology profiles for a school. What might collaboration look like in these different types of classrooms? Setting expectations is important for collaboration at any grade level. What expectations will you have for students in your classroom? How will you communicate these expectations? Technology can be used to connect with global partners. Why might you connect your classroom to a collaborative partner in another city, state, or country? Figure 5.1 provides examples of criteria you may have in mind when looking for a digital tool. Keeping your learning goals for an upcoming activity in mind, list a handful of your own criteria to find the right tool to introduce to students. On page 79, the author reminds readers to take "everyday logistics" into account when planning learning experiences for students. Why is this important? What logistics are unique to your learning environment? Figure 5.4 includes a list of digital tools in the author's tool belt. Which tools on this list are familiar to you? Which tools would you like to explore further? Supporting colleagues is important, even if you don't hold a coaching or mentoring position. Which suggestions for supporting colleagues resonate with you? 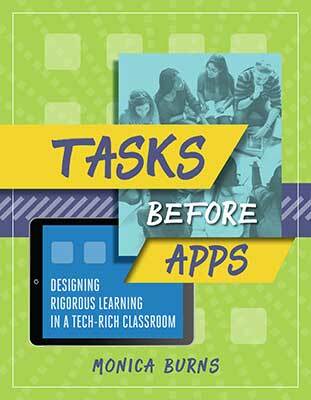 Tasks Before Apps: Designing Rigorous Learning in a Tech-Rich Classroom was written by Monica Burns. This 110-page, 7" × 9" book (Stock #118019; ISBN-13: 978-1-4166-2466-0) is available from ASCD for $18.36 (ASCD member) or $22.95 (nonmember). Copyright © 2018 by ASCD. To order a copy, call ASCD at 1-800-933-2723 (in Virginia 1-703-578-9600) and press 2 for the Service Center. Or buy the book from ASCD's Online Store.